Irish PGA champion Michael McGeady fired a fabulous eight under par 60 to win the gross in the North Western Golfing Alliance outing at Dunfanaghy on Saturday. The Derry man took advantage of light winds and soft greens to tear the course apart. He birdied the first two holes and then picked up a hat-trick of birdies from the seventh to turn in five under 28 before coming home in three under 32 for a blemish free card and a seven shot win over local professional Seamus McMonagle (67). Portsalon’s John G McBride was third with a 68 while in the nett Faughan Valley’s Alan Chung had 42 points to win by two from City of Derry’s Keelan Quigg with Strabane’s Maurice McGettigan third and North West’s Delwyn Montgomery fourth, both with 39. It was Chung’s second win of the season following his victory at Ballyliffin in October and the surprise was that he beat a one-handicapper in Quigg into second place. There is just one more counting event in the Golfer of the Season battle and it’s a two-horse race with Michael McGeady leading by 10 points from Brian McElhinney with only 10 points up for grabs for the winner of the March 8 outing at Rosapenna. In the nett section, five members are still in with a chance — Odran McGettigan on 26, Eddie McHugh on 25 and Maurice McGettigan on 22. Alan Chung and Clive Davison are the outsiders on 20 and 17 respectively. Maurice McGettigan (16) Strabane 39 PTS B.O.T. Glenn Hinds (10) Faughan Valley 38 Pts B.O.T. Eugene Corry (10) Newtownstewart 38 pts B.O.T. James Lindsay (1) North West 71 B.O.T. “2” s M Houston, S Quigg, G Duffy, J Harley, J Coyle, M Doherty. Next outing: 8th March in Rosapenna Golf Club. Michael McGeady, pictured above en route to victory in the Irish PGA at Roganstown, won the North Western Golfing Alliance outing at Rosapenna. Picture: Thos Caffrey / www.golffile.iePaul MacLochlainn won the St. Patrick’s Perpetual Plate as reigning Irish PGA champion Michael McGeady took the gross prize in the recent North Western Golfing Alliance outing at Rosapenna’s Old Tom Morris links. 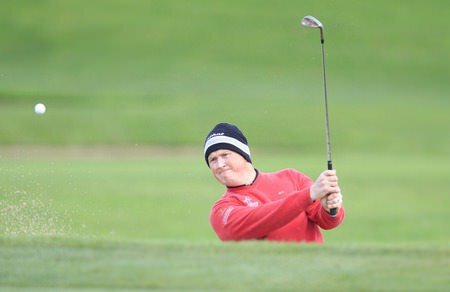 Strabane's Maurice McGettigan defied gale force wins to rack up 40 points and cruise to a six-point win over his brother Odran in the North Western Alliance outing at Ballyliffin Old on Saturday. Michael McGeady followed his winning 60 at Dunfahaghy last week with a 71 gale force winds to claim the nett (and the gross) as well as the Golfer of the Season prize in the North West Golfing Alliance outing at Rosapenna's Sandy Hills on Saturday.